This entry was posted in Forex Trading Journal, Winning Trade and tagged forex trading eur usd, forex trading strategy by ForexPhil. Bookmark the permalink. 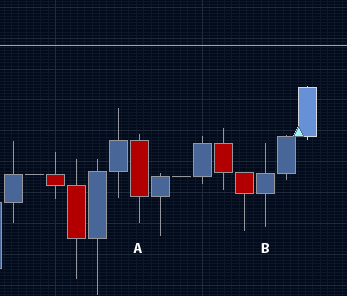 hi forexphil, if candle A is an inside bar, shouldn’t it be inside its previous candle? or did you take into consideration the 2 previous candles of A as the mother candle? Candle A is actually the mother candle and the next bars are its children. And they are the inside bars. See that when the child breaks out of the mother’s range, it went and continue to trend up. Okay, so you only look at the body and disregard the wicks of the candle? How about the wicks of the child candles, would’t you consider it as an attempted breakout if it pierces the range and came back? Not entirely. The wicks are good indicator for confirming your first assessment of the trend. If it makes consistent false breakouts then there should be a move favoring the other side.